Podcast #33: The 6 Big Risks & What To Do About Them….USA Style! Risk. The Oxford Dictionary defines risk as 'the possibility of something unpleasant or unwelcoming happening'! It is therefore not a word which most of us are that much inclined towards. There are many forms of risk which many of us don't really think of until it happens! In this episode we will unearth these risks, and indeed share ideas on what one can do to manage them (if possible!). On a related but separate note we are delighted to tell you that we have written & launched our first ever quick-guide resource for you guys! 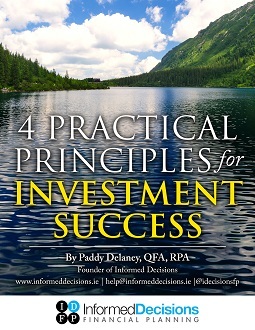 This was based on your feedback to our Financial Planning in Ireland Survey a few short months ago. We want you to download your own complimentary copy of the '4 Principles Guide' to Investment Success; simply click the pop-up or head over here and add your email, we'll mail it directly to you, for keeps, at no charge at all........limited time offer! Flick over to the written version if you prefer to read this episode!